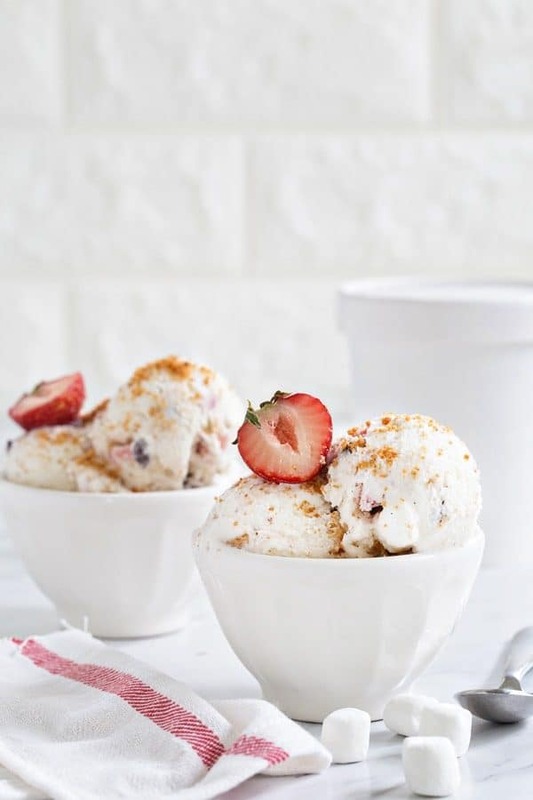 Strawberry S’mores Ice Cream couldn’t be better for a summer dessert. It’s cool and creamy, and just the right texture thanks to a secret ingredient! This is a sponsored post on behalf of Karo® Syrup. Thank you for continuing to support the brands that make My Baking Addiction possible. The weather is glorious right now in Ohio. Just right for ice cream and all the trimmings, I’ll tell you that much. 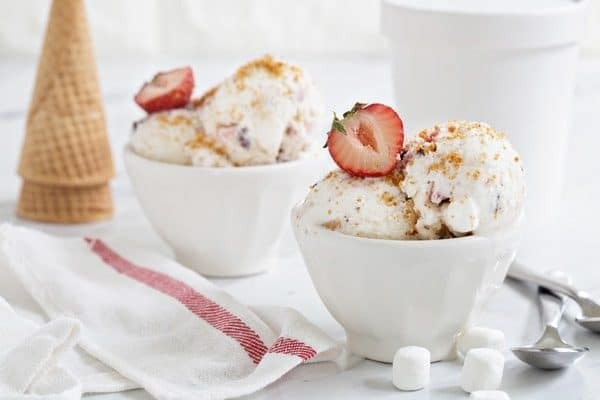 Elle and I’ve been doing lots of baking in our air conditioned house, but when we go outside, we’re ready for an icy frozen treat, and this Strawberry S’mores Ice Cream is topping the list right now. It’s ridiculously easy to make, and the recipe yields a full quart, making it great for dessert any night of the week. It’s exceptionally good post grilled steak while the fire flies blink. We’re planning to do a lot of grilling this summer. Now that our patio is going in, and Elle’s swing set is finally being installed, it’s going to be all backyard, all the time. I’m thinking a weekly Sunday barbecue is exactly the thing to take advantage of this new outdoor space, and dessert is going to be a MUST. Ice creams like this are great, because you can make them ahead and just have an ice cream bar ready to go with some extra toppings – chocolate sauce, sprinkles, chopped peanuts. Any of those would be great. 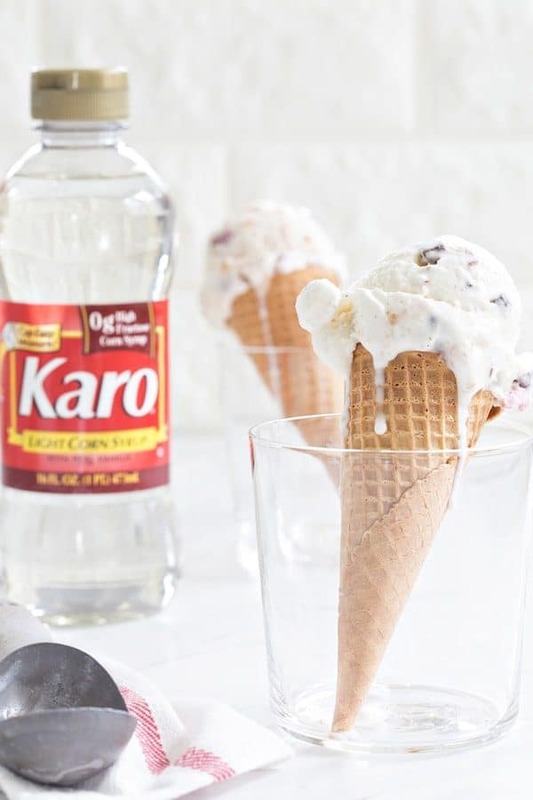 You could probably use any mix-ins you want for the base recipe, but one thing you absolutely cannot miss is the perfect sweetness from using Karo® Syrup. That sweet little addition is what keeps this ice cream perfectly scoopable, right out of the freezer. I will say that I think this ice cream is perfect, just as is. It doesn’t need any other toppings. 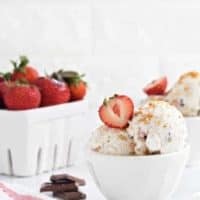 Basically, you’d be gilding the lily, and while I’m not against that, in this particular case, I think strawberries + s’mores = the most perfect summer ice cream ever. You will need an ice cream machine to make this, so keep that in mind, and get your bowl in the freezer now! You’ll also want to chill any mix-ins you’re adding, and yes, that means the graham crackers too. The original recipe does not call for strawberries, but they make a perfect addition here, I have to admit. 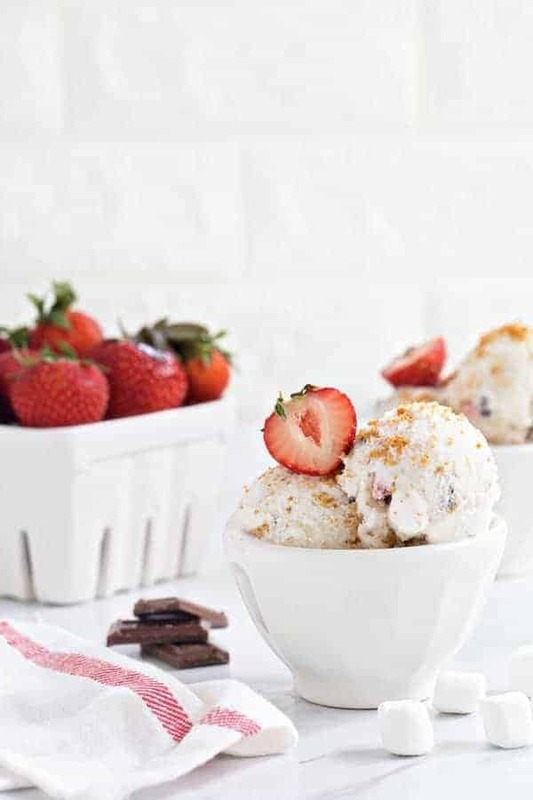 Strawberries, chocolate, marshmallows, and graham crackers in one delicious ice cream? Who wouldn’t be into that combination, I ask you? I prefer this ice cream after it’s been frozen for at least four hours, though you can eat it directly out of the ice cream machine if you want to. Either way it’ll be perfectly scoop-able and ready for your bowls and cones. This is an ice cream worth of summer barbecues and nights by the lake, so make a little extra by doubling the batch. Everyone will go nuts for it! And don’t forget the Karo® Syrup. The texture of this Strawberry S’mores Ice Cream is everything, and you won’t get that without it. For more delicious recipes using Karo® Syrup, be sure to check out these Mini Chocolate Pecan Cheesecakes and this Chocolate Chip Cookie Sandwich Ice Cream Cake, both are perfect for summer entertaining! Combine milk, cream and sugar in a mixing bowl and stir well to dissolve the sugar. Add corn syrup, vanilla extract and salt; continue stirring until well blended. Chill at least 1 hour. Pour mixture into ice cream machine bowl. Process according to manufacturer directions for 25 to 30 minutes or until the consistency of thick soft-serve ice cream. Churn in marshmallows, graham crackers, chocolate and strawberries the last minute of churning or fold in after transferring to a storage container. The ice cream can be served freshly made or stored in a container in the freezer. The ice cream will become more solid in the freezer. Always chill any stir-ins to be added to the ice cream. The amounts in this recipe will fill one 1-quart size ice cream machine bowl. Bowl sizes may vary by manufacturer so amounts may need to be adjusted accordingly. Place a storage container in the freezer before mixing begins to help prevent melting while transferring from the machine. For firmer ice cream freeze in container for at least 4 hours. When adding ingredients you will need a container that holds at least 1-1/2 quarts. I was just talking with a friend about how we both love the s’mores flavor but prefer it in other forms (brownies, cakes, pie, etc) rather than eating actual s’mores. This ice cream is perfect for me today! This ice cream is perfect for me today! Do the marshmallows stay soft? Hi, Caitlin! Yes, they should. I hope you enjoy it!